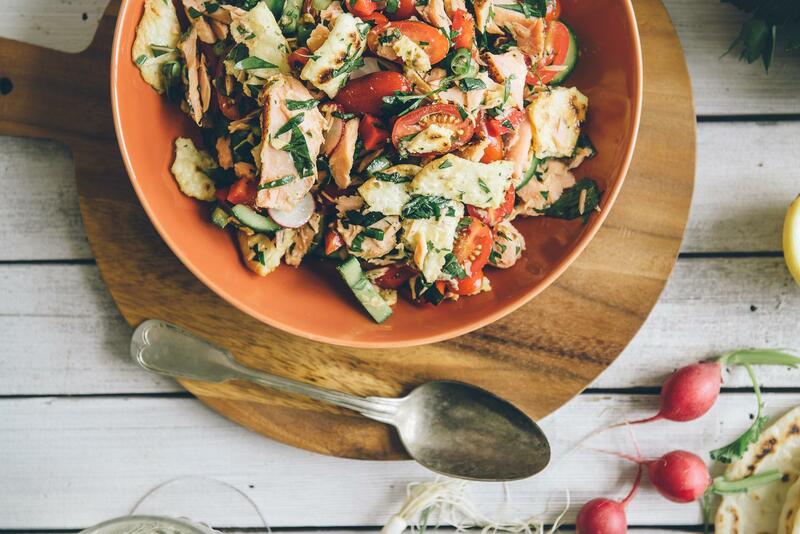 My fattoush salad has the added ingredient of hot smoked salmon. It’s the perfect summer fare. I love receiving packages in the mail. It’s just the waiting I hate! So imagine my delight when I received a box of freshly packed Huon Salmon (#Huonsalmon) right at my door. All the way from the pristine waters of Tasmania! In the interests of being up front and adhering to full disclosure, I was recently asked by the folks from the Huon group to sample a few of their products and whip up with a few recipes. I ordered from their Reserve Selection range and decided on a mixture of “hot smoked” salmon and some of their sliced “cold smoked” salmon. I went through a number of options in my tiny test kitchen but in the end I went with a Middle Eastern slant. As much as I am willing Autumn to hurry up and get here, Sydney just wants to keep the warm weather around for a little longer. In the end I went with a salad. But this is no ordinary salad. It’s a conglomerate of crunchy goodness. Every bite screams fresh! I’ve taken liberty with the Lebanese fattoush and added my little spin on it. 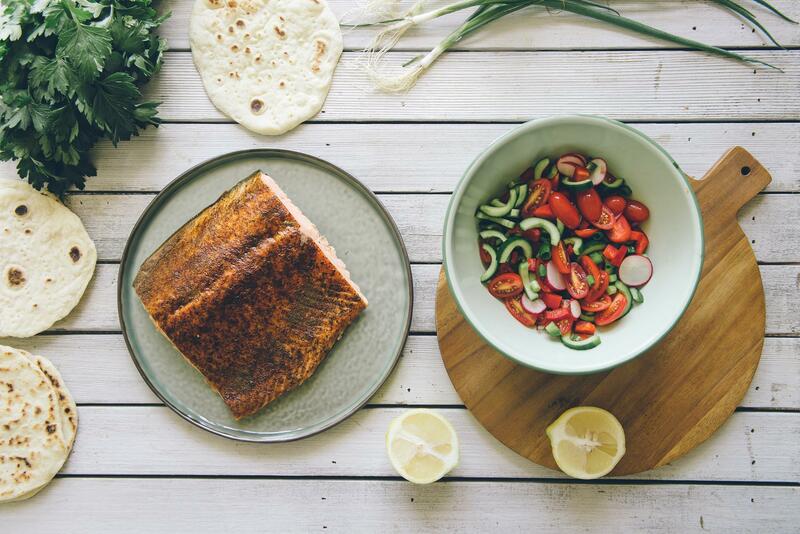 The Blackened Spice hot smoked salmon paired beautifully with the crisp veggies and baked home made pita bread. The dressing containing exotic, sweet pomegranate molasses and lemony sumac was the perfect accompaniment to this creation. And because I couldn’t help myself I decided to use up some of the cold smoked salmon and make a little dip to accompany all those pita breads. (The recipe for these pita breads will be coming shortly). 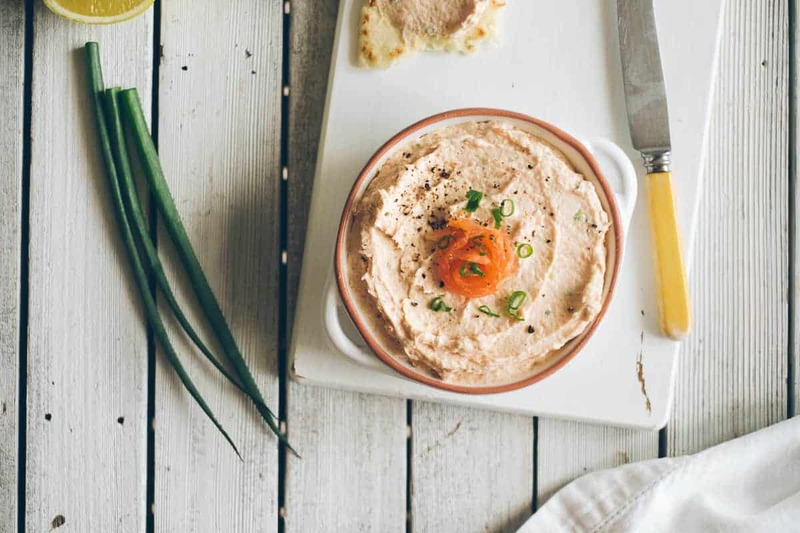 We all know that smoked salmon and cream cheese pair well together but what if that combo also got a little Middle Eastern love? That’s right. The dip I made has cream cheese, spring (green) onions, a little yoghurt, pomegranate molasses and sumac. Perfect for that first round of drinks at your next dinner party. I served this up for some friends the other night and the bowl was wiped clean in minutes! Preheat your oven to 190 dec C and line a baking tray with baking paper. Brush a little olive oil over the pita breads, place on baking tray and cook for 5-8 mins until the pita breads are crisp. Remove and allow to cool. Add the capsicum, cherry tomatoes, cucumbers, radishes, spring onions, herbs and salmon to a large bowl. Crush the cooled pita breads with your hands and add to the salad ingredients. Whisk the dressing ingredients in a large jug and pour over the salad, toss and serve immediately. Serve in a bowl, garnished with a slice of smoked salmon and chopped spring onions.